Philip Peterson of Dynalectric and Andy Berg of NECA are highlighted in a recent video about San Diego’s construction industry, from the San Diego Source. This year’s Closing Celebration got started just after sunset over the San Diego Bay, on the North Embarcadero behind the Convention Center. Guests arrived to find concert seating flanked with smaller cocktail tables and outdoor heating lamps to keep the evening chill away. Cash bars and snack boxes added to the late-summer picnic atmosphere, as friends and families spread their NECA 2011 San Diego fleece blankets on the soft turf. Former Beach Boy Al Jardine and his Endless Summer Band took the stage shortly after 8 p.m., playing both old favorites and new surf tunes. The good weather held for convention-goers to enjoy one last night of catching up with old friends and making new ones. Couples, parents and kids all took spins on the grassy dance floor, each doing their best “surf board boogie.” The music was occasionally overshadowed by planes from the San Diego Naval Base, but nothing could block out the stars winking overhead and on the stage. It was wonderful way to end another wonderful NECA convention and trade show. We’ll see you all in Las Vegas at the Mandalay Bay, Sept. 29-Oct. 2, 2012! Check out our new website at www.necaconvention.org for preliminary event and exhibitor info! NECA 2011 San Diego may have been my first convention as NECA’s new Business Development Director, but I immediately got a sense of renewed purpose for electrical contractors diving into new and emerging energy solutions markets. Whether renewable and alternative power generation or advanced lighting and building controls, many attendees were there to learn as much as they could about business and market development. There were many new things about NECA 2011 San Diego. The conference hosted the first-ever NECA Energy Forum, an event that saw a capacity crowd and received a tremendous amount of positive feedback. It would have been impossible for anyone sitting in the audience to miss one speaker after another reinforcing the same positive message: Emerging technologies represent the direction in which our industry is moving and represent a tremendous opportunity for any contractor willing to tackle a new way of doing business. In addition to the Energy Forum, NECA also unveiled NECAWORKS™, an energy economic modeling tool. The web-based screening tool provides NECA members with the fundamental tools and resources to capture renewable and energy efficiency project opportunities by determining the Benefit/Cost Ratio. Since transitioning to a new way of doing business is never easy, even with the help of impressive tools like NECAWORKS, NECA went the extra mile in San Diego to describe the importance of business development. IBEW International President Edwin D. Hill spent much of his time as a guest at the podium for NECA’s 2011 Board of Governors meeting detailing the IBEW’s new emphasis on business development and expressing his strong belief in its importance in recapturing lost market share and gaining new market share. NECA President and President/CEO of Valley Electric Consolidated, Inc. Rex Ferry also stated the importance of business development for electrical contractors during his keynote address at the conference’s opening general session. Ferry spoke of how there was a new paradigm at work and that NECA members could no longer afford to sit around waiting for bids, but how they needed to proactively engage in business development to capture work. He talked about how VEC, Inc. was doing just that. NECA also successfully convened the first meeting of a new business development task force chaired by Daniel G. Schaeffer, NECA District 7 Vice President and President of Schaeffer Electric Company, as well as two meetings on the topic of business development. The first was an internal meeting of the business development working group for NECA and Labor-Management Cooperation Committee (LMCC) business developers, NECA chapter managers and staff working on business development, and IBEW business managers and staff working on business development. I was honored to host the meeting, and I had a great team of panelists: Jim Ayrer, IBEW International; Darlene Besst, Northern California Chapter; Jim Curran, St. Louis Chapter & IBEW Local 1, LMCC; Terry Hatch, Washington, Statewide LMCC; Bernie Kotlier, California, Statewide LMCC; Ken MacDougall, Penn-Del-Jersey Chapter; Thomas Martinez, Los Angeles Chapter & Local 11, LMCC; Jennifer Mefford, SE Michigan Chapter & Local 58, LMCC; and Karen Prescott, San Diego County Chapter. Together, we updated the audience on our local and national initiatives and described the wide range of activities that constitute business development. James Willson, NECA Los Angeles County chapter manager, also spoke passionately at the event, as did President Ferry, reiterating his belief in the importance of business development. The audience also deserves thanks for their interest, their questions and thoughtful interactions with the panelists. The second business development meeting was held as a convention management seminar. Karen Prescott started off the meeting with introductions. I followed with a recap of the prior day’s meeting and emphasized the wide range of activities a successful business development program can consider. Next, Jennifer Mefford gave an impressive presentation on the nuts and bolts of business development and how to get started when it seems like you don’t know where to begin. Bernie Kotlier closed with specific game changing examples, including the California Advanced Lighting Controls Training Program (CALCTP), the Electric Vehicles Infrastructure Training Program (EVITP), and the Sustainable Sales Placement Program which is focused on retraining highly successful sales people on the art of selling sustainable services and placing these individuals at member contractor firms. NECA will hold its next meeting on business development at the Association Executive Institute (AEI) in at the Mandalay Bay Hotel & Casino in Las Vegas, NV on Wednesday, Feb. 29, 2012. You can also expect to hear more from me on our business development blog, along with guest blogs authored by my business development peers from throughout the country. They are doing some amazing work, and they are growing in numbers. I wish all of them could have spoken at this year’s conference, but you will hear more from them shortly. I would like to close by giving thanks to all that help raised awareness of the importance of business development at this year’s conference. Emerging energy technologies and business development truly represent a paradigm shift for our industry and NECA will do everything in its power to help members prepare. Tim McBride, President of San Marcos, Ca –based Southern Contracting Co.and Board President of the San Diego Chapter, National Electrical Contractors Association (NECA), was recognized by San Diego Mayor Jerry Sanders this week at a citywide press conference as installation began on the new lighting upgrade project which will retrofit 80 percent of the city’s street lights to energy-efficient fixtures. San Diego will save $2.2 million annually from reduced energy and maintenance costs. The $16 million retrofit is funded by a financing package that includes a $13 million bond, $2 million in federal grant stimulus funding, and a $3 million low- interest state loan. The $13 million bond is a federally-backed Qualified Energy Conservation Bond, a program that came out of the American Reinvestment and Recovery Act, the original recession stimulus legislation. 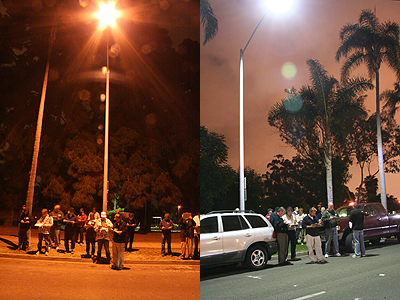 In addition, San Diego Gas & Electric will provide a one-time $1.2 million rebate for the lighting change. More than 35,000 induction technology street light fixtures, using broadband light technology, will replace the old sodium vapor lamps. The new light fixtures will be brighter and make colors easier to see at night because they produce a broader light spectrum than sodium vapors. McBride has also pledged to make the job “zero-waste” by recycling all the old building materials rather than hauling them to a landfill. Every year at the Association Executives’ Institute, the chapter manager for the NECA Convention host city – AEI is always held in the same city, usually six months prior to the convention – is asked to give a brief introduction to the area. Most of us have learned to include the phrase, “No, I cannot help you get baseball playoff tickets.” Of course, this year I didn’t even have to worry about that. Since you won’t be heading over to PetCo Park to watch a World Series game, you can spend some of your time in San Diego thinking about what you want your company’s future to look like. Chances are, it’s going to look a lot different than its past. San Diego and the state of California have been on the leading edge of the green energy revolution which makes it entirely appropriate that NECA’s first-ever Energy Forum will be held in our fine city. That’s where I will be on Saturday, Oct. 22, and you should be there as well to learn about everything from Utility Grade Wind Power to Electric Vehicle Charging Stations, and even financing options for your customers that want to “go green.” Starting Sunday morning, Oct. 23, please make sure to spend time at the NECA Show where almost 300 exhibitors will be on hand to show the latest and greatest tools and technological advancements to help make your business more successful. Don’t worry; you will have plenty of time to explore America’s Finest City and some of its world-famous attractions such as the San Diego Zoo, Sea World and my favorite, the Wild Animal Park. If you are looking for a great restaurant, San Diego has hundreds of them. Perhaps the easiest way to find one is just to walk up 5th Avenue into the Gaslamp District and read the menus posted in front. You cannot go wrong eating at any restaurant on 5th Avenue. For you golfers out there, no trip to San Diego would be complete without playing a round at Torrey Pines. But if you don’t want to challenge the course the pros play on, there are many other alternatives less than 30 minutes from your hotel. One other thought on how to spend your free time: Since the Opening Reception aboard the USS Midway is going to give convention-goers a behind-the-scenes look at the ship you wouldn’t ordinarily get on a standard tour, consider using free time you may have to take the water taxi to visit sites across the San Diego Bay, like the Hotel Del Coronado. You can pick up the water taxi from the terminal right behind the Convention Center or just stroll along the Bay’s pathways and bridges for a breath of fresh air. Actually, NECA 2011 San Diego promises to be big breath of fresh air for everyone. Our industry has gone through a lot in past few years, and I always appreciate spending time with my colleagues from across the country who can give me a different perspective and some new ways of thinking about our work. And although the nearest baseball playoff game will be in neighboring Arizona, I am sure that you will still enjoy the Convention and your stay in San Diego. Please let me know if there is anything I can do to help make that so. Discover California’s Southern Coast — NECA Style! Want to extend your stay in sunny California? Join us, October 26– 28, for a post-convention tour and discover California’s spectacular southern coast — from San Diego to LA. Visit the beach towns of Laguna, Newport and Long Beach. Stay in the fabulous 5-Star Terranea Resort, located just south of Los Angeles.Your friends and family are welcome too! Download the full agenda and registration form today! So What Exactly ARE Weekend and A La Carte Registrations? These days, everyone is doing more with less. We know it, our NECA contractors know it, and everyone who has to ever travel for business knows it. Which is why NECA 2011 San Diego is featuring our first-ever weekend and a la carte registrations. Weekend and a la carte registrations are exclusively available to NECA members. If you want to minimize the time and money you spend away from the office, while maximizing your education and experiences in San Diego, these are the best choices for you. Includes everything from Weekend Package #1 (Energy Forum and Green Energy Challenge, plus all Sunday Convention and Trade Show events), with the exception of admission to the Saturday, Oct. 22 Opening Reception aboard the USS Midway. Items on the A La Carte registration menu are single-sessions only, without any of the Full Registration events (General Sessions, Opening Reception and Closing Celebrations). You can sign up for multiple a la carte items – just make sure your sessions don’t overlap! Pre-Convention Workshops, Friday, Oct. 21-Saturday, Oct. 22: One of NECA’s more popular educational offerings at the annual convention, Pre-Convention Workshops are multi-hour, hands-on programs developed for electrical professionals who want in-depth training. Prices vary by session; a full listing of course descriptions and prices is available here. 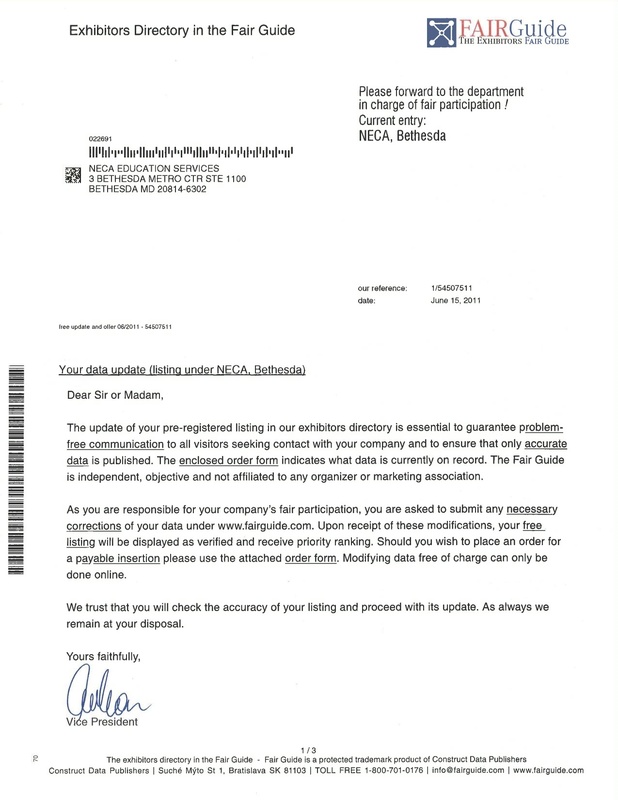 2011 NECA Show exhibitors may soon receive their own version of the document pictured below, from a data-mining company claiming to be verifying your company’s contact information for the NECA Show. Please be aware, neither Fair Guide or Construct Data Publishers, are collecting this information on behalf on NECA. If you complete and return this form, you actually authorize this company to bill you over $1700 and re-sell your information to other marketers in their own publication! We value our NECA Show exhibitors, and we do our absolute best to protect the investment you have made in the NECA Show. Your company listing in the NECA Show Guide, NECA’s convention and exhibitor websites, and posting your press releases for NECA 2011 San Diego attendees is included in your exhibitor fees. Unfortunately, it only takes listing your company name in the NECA Show Guide for unscrupulous data mining companies like Fair Guide to try to gather your contact information to try to make a quick buck for their own guides that they sell to other marketers. Don’t be a victim of this scheme! If you ever have a question about any materials you receive about your participation in the NECA Show, contact Julie Duda, julduda@necanet.org, or Sue McCart, sue.mccart@mindspring.com or phone the NECA Show office, 301-215-4506. Guest Post: Calling All Future Leaders! The 2011 NECA Future Leaders Conference is now history, but NECA’s Future Leaders have a way of making sure their impact is felt well after an event. That’s why I’m reaching out to encourage any young and emerging professionals working at NECA member companies to join the Future Leaders at NECA 2011 San Diego. Convention has added several great registration options, like weekend packages and a la carte options, for those who can’t afford to spend much money or time out of the office. While MEI has put together an outstanding series of management seminars, it has been my experience that what matters most to NECA Future Leaders are the peer-to-peer networking at goes on at the Convention and Trade Show. There really isn’t a better time or place to start voicing your opinion about our industry that needs the Future Leaders’ insight and enthusiasm. So here we are with NECA 2011 San Diego only four months away. I hope you will use this time for two things: first, if you haven’t already done so, get involved with NECA’s Future Leaders program. Future Leaders is open to anyone under age 47 working for a NECA member contractor. We’d especially love to hear from professionals who may have just begun their career in electrical contracting (and if you haven’t already done so, check out our online MEI course, Contractor 101, for the insider prospective on what you can expect during your career). The Future Leaders program has made some incredible gains in the past few years. Our members are now serving on national standing committees and taking a greater role in shaping the resources the association provides to support the electrical construction industry. Second, I hope you’ll make your plans today to meet your fellow Future Leaders at the San Diego 2011 Convention and Trade Show, Oct. 22-25. We’re offering several pre-convention workshops and the all-new Energy Forum before the convention kicks off with the Opening Reception, which are a great way to capitalize on your participation. You should also plan to join the Future Leaders for an informal reception on Monday, Oct. 24 where we will announce plans for the 2012 Future Leaders Conference. Anyone interested in receiving updates of Future Leaders activities and event announcements should contact me, Greg Mankevich, at 301-215-4550 or email greg.mankevich@necanet.org.